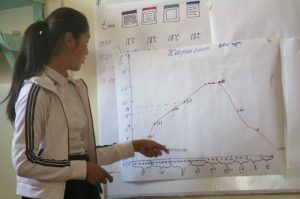 In partnership with CAMP Ala Too and their Kyrgyz Mountains Environmental Education and Citizen Science Project (KMEECS Project), this app was created in order to allow students in Naryn province to become citizen scientists by collecting data on various plant's phenologies throughout the year. In rural areas, science is often thought of as something that "regular people" cannot be involved in. This project will help to combat this notion and teach the next generation that they can have a direct impact on the world around them by being citizen scientists. Note: This app has no English version as the intended audience is students in a rural area of Kyrgyzstan.